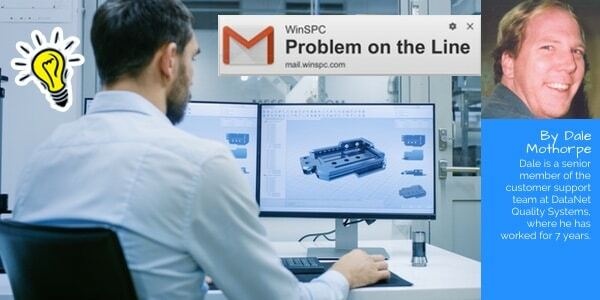 You can have WinSPC send an email which will send a message containing relevant and useful information as a result of any Control Test violation, such as an out of control condition. 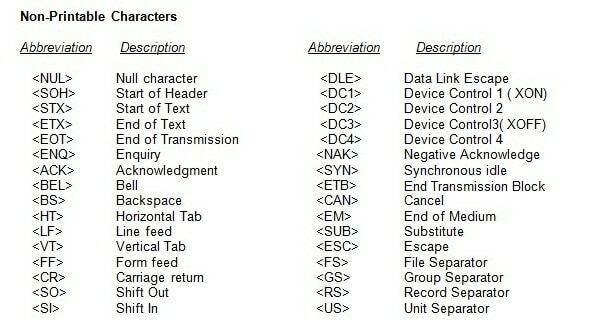 This will help the operator or email recipient to make an informed response and possibly lessen areas of confusion. Email messages can be configured using information stored within WinSPC, and you can add your own text. 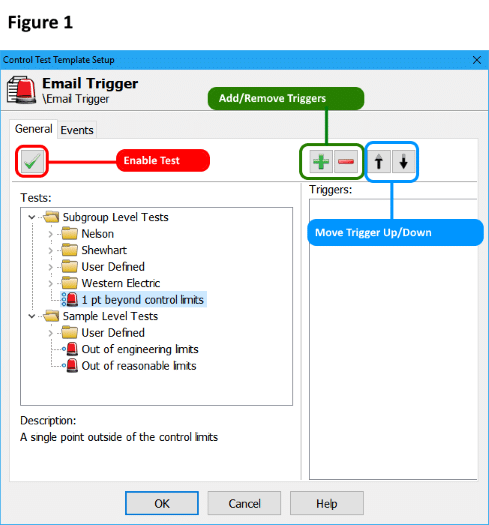 In the Control Test Templates are where you specify conditions and actions for an Email Trigger. Once the Control Test Template fires it will execute the response that is set by the Triggers. Log into WinSPC as the Admin user or a user that has permissions to create or edit Control Test Templates. Select the Control Test location by a single left-click on the Control Test Templates root level branch. If the device is to be created in a subfolder, single left click on the plus sign [+] in front of the Devices branch and drill-down and select desired folder in the Tree window of the Administrator window. Left-click on the New Control Test Template icon button on the Administrator window toolbar. Right click on the Control Test Templates branch (or subfolder), located in the left Admin screen, and select New then select Control Test Template from the popup window. Left-click the on the File menu on the Administrator screen and select New then select Control Test Template. Select a Control Test Template folder, from the left Admin screen, and press the Insert key on the keyboard. Enter a name for the device by overwriting the existing text with the desired name and pressing the Enter key on the keyboard. The name of a Control Test Template must be unique to the folder in which it resides. Right-click on the Control Test Template name and select Rename from the shortcut menu that is displayed. Type in a new name and press the Enter key on the keyboard. Press the F2 key on the keyboard. Type in a new name and press the Enter key on the keyboard. Left-click on the Control Test Template name, then a single left-click a second time on the Control Test Template name. Note: This is not a double-click. Type in a new name and press the Enter key on the keyboard. With the Control Test Template selected, Left-click on Edit in the menu toolbar, of the Administrator window, and select Rename. Right-click on the Control Test Template name and select Delete from the shortcut menu that appears. Left-click the Yes button to confirm the deletion, or left-click the No button to cancel the deletion. Press the Delete key on the keyboard. Left-click the Yes button to confirm the deletion, or left-click the No button to cancel the deletion. Left-click on Edit in the menu toolbar, of the Administrator window, and select Delete. Left-click the Yes button to confirm the deletion, or left-click the No button to cancel the deletion. Double-click on the Control Test Template icon, or name. Right-click on the Control Test Template icon, or name, and select Properties from the popup dialog box. Left-click on the desired control test to be enabled (see Figure 1). Left-click on the green checkmark in the upper left-hand part of the window to enable the test. A green check mark will appear in front of the Control Test indicating that it is enabled. 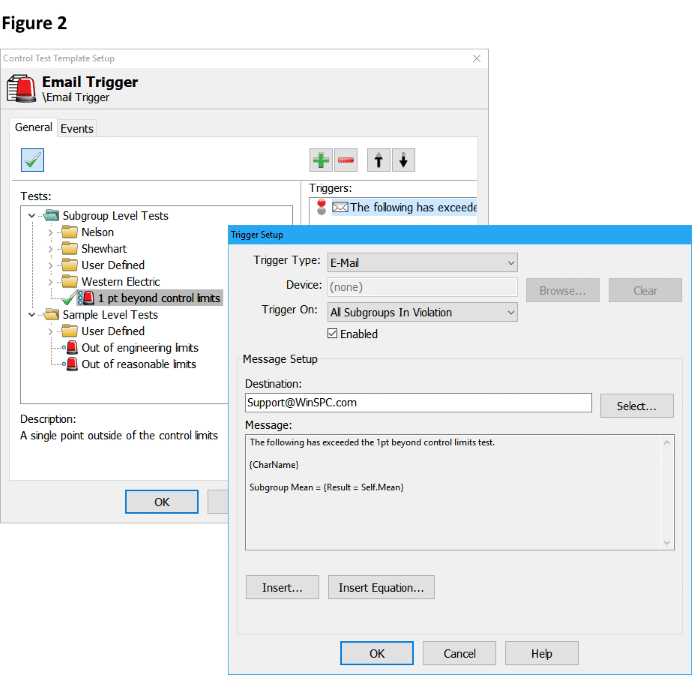 Left-click on the Trigger Type: drop-down box, in the Trigger Setup window, and select E-Mail. Left-click on the Trigger On: drop-down box, and select the desired Trigger On types. Choices are as follows. The Enabled checkbox should be checked by default. If not, you may select to enable it here by putting a checkmark in the Enabled checkbox. Enter the Destination address within the Message Setup box with either a valid e-mail address or add a WinSPC user or station name using the Select… button. This assumes that the Admin has already set up the E-Mail capabilities in the System Settings of WinSPC. To enter text to the body of the e-mail, using any of the following combinations. Plain Text – Click in the Message text box area, and type in the text that you would like displayed when the trigger fires. 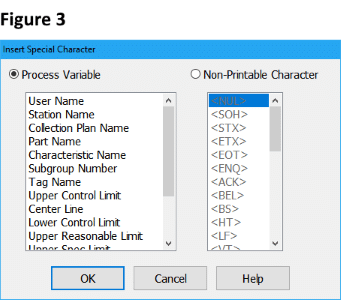 Special Characters – Click the Insert… button to display the Insert Special Characters window. Select either the Process Variable radio option to add predefined information, or select the Non-Printable Character radio option to add a non-printable character to the text box. Select the desired variable or character then press the OK button. Following this article is a list of available selections. (See Figure 3). Insert Equation – Click on the Insert Equation button to display the Equation Builder window. Within the Equation Builder window, double-click on the desired Function, Operator, Statistic or Variable that you would like to appear first in the equation. This copies the Function, Operator, Statistic or Variable to the right of Result = in the Calculation Text area. Click the Ok button to add the equation to the email text box. An example of this would be Result = self.mean, which would return the mean (average) of the subgroup. For more information on the Equation Builder click on the following link: How do I use the Equation Builder? Click on the OK button to save an exit from the Control Test Template setup window. The newly created Control Test Template is ready to be added to a Collection Plan, Short Run Process, or Parts/Processes.